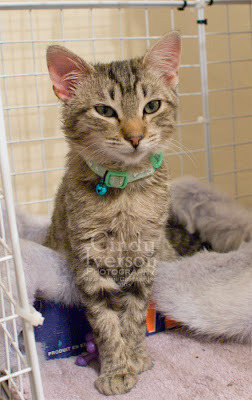 Hi, it's Lucy here writing my own blog post to commemorate 50 days since I was rescued and brought here to my new home! I decided to write about one of my favorite activities--sleeping. When I'm not tearing around jumping and pouncing on the bigger kitties, I'm sleeping. I like to sleep on one of my people best. 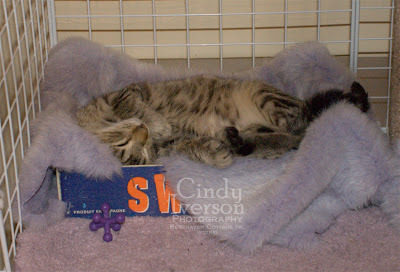 But if they aren't available, I like to sleep in my lavender fuzzy bed with a special kitty heating pad in it. But for some reason, I get awakened a lot by a flashing light thingy. It's quite annoying. Daddy why are you always pointing that thing at me? I usually give up trying to sleep after the flashing light thingy starts. It's too hard to stay asleep, and I'm too curious. I'm usually pretty groggy but that doesn't stop me from being curious. And sometimes I get up with a bad case of bedhead. Yikes! But at least I had the presence of mind to do "fancy paws" like the big kitties do. Well... almost. Hi Lucy! That's a good Fancy Paws pose you are doing. I think sleeping is a very fun hobby. You have a very soft-looking bed. 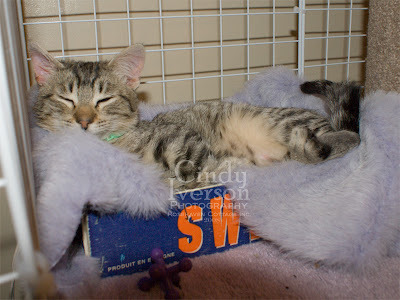 Lucy, we caTchuldrin at sunflwr hil R gLAd U r doin good in ur nu hOME. Sory 4 spelin, MUNgus doznt tipe so gOod. But DoNT tel R muM, she DozNT no we uze tha puter at all! 50 days? Has it really been that long? Crikey, time has gone so fast! She is really cute! Glad all the other cats are getting along with Lucy:) And hasn't she grown?! She looks bigger and a lot fluffier! Aaw, she is definitely happy that's for sure! Little Lucy, you are looking lovely! Keep looking so sweet and practicing your fancy paws. Lucy, you are just the cutest! Hi Lucy, you are not so little anymore, are you? How you have grown! You are turning into quite a little lady. Love your coat, our Kadootje has the same colour but she has some white with it too. Sleeping is the best hobby you could ever have, we know that for a fact, especially when you have such a nice lavender fuzzy bed with heating!!! Purrrrrrrrs from the Bliss team! BTW we're having a party. What a wonderful life you have..it looks like a lot of fun living at Rosehaven Cottage..You definitely know how to strike a pose! What a pose! So cute!!! What a cutie pie! Thanks for giving us updates on Lucy! What a cute kitty! No wonder so many flashing lights! I love Lucy! It's so great to get her updates. That is a Lucky Lucy!